The family-friendly community of Araby is divided into two distinct halves. Araby Commons is bordered by Highway 111B, while Araby Cove is located further south on the edge of the San Jacinto mountain range. As part of a luxurious South Palm Springs community, Araby real estate has an attractive aesthetic and modern conveniences, making it an ideal space for those looking to embrace the Palm Springs lifestyle. Continue down the page to start your search for Araby Cove homes for sale or Araby Commons real estate. Alternatively, explore this neighborhood's surrounding amenities. Register with me for complete access to our Araby real estate listings. Search by map or create custom searches to find the exact properties you're looking for. Araby real estate belongs to one of Palm Spring's most desirable neighborhoods. While some of the earliest buildings in this neighborhood were first established in the 1920s, the majority of houses here today are luxurious recent constructions. 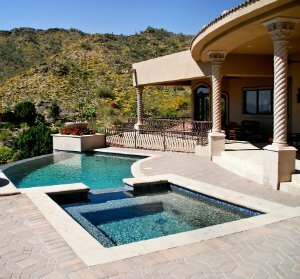 Lots are spacious, and many Araby residents have made the most of them and have in-ground pools. Amidst towering palms, dive into sparkling blue waters and swim a few laps each morning. Listen to the sound of the decorative fountain circulate pristine waters while you relax with friends on the rear patio. One of the many pleasures of living in the desert is the consistently warm temperatures, and these homes offer you features that allow you to make the most of the weather. Home designs are distinctly desert inspired. You'll find stone to be a popular building material in Araby and throughout Palm Springs. It not only offers an attractive durable exterior, but also regulates temperature so that your home is cool during the day and warm at night when the evening chill sets in. Floor-to-ceiling windows and skylights ensure that even when you're inside, there's no shortage of sunlit spaces to enjoy. For parents with young children, Araby presents a great place to raise their family. This community is within ten minutes of Cielo Vista Charter School. As the top elementary school in Palm Springs, this competitive institution is in such high demand students have to reapply for attendance each year. With a comprehensive music program, and an after school program that teaches children drama, ballroom dancing, gardening, and more, it's easy to understand why parents want their young ones affiliated with this prestigious school. In addition to being close to top schools, this neighborhood is close to a number of nature trails where families can go for weekend hikes and explore the unique desert landscape and wildlife in the Palm Springs Valley. These homes are also close to Wet N' Wild, an impressive water park ideal for special events like birthday parties. This amusement park boasts a seven story waterslide. As a Palm Springs real estate expert, I know exactly how fast things can change in the Araby real estate market, as well as in other areas of the Coachella Valley. Contact me to work with an agent who delivers results quickly and efficiently.